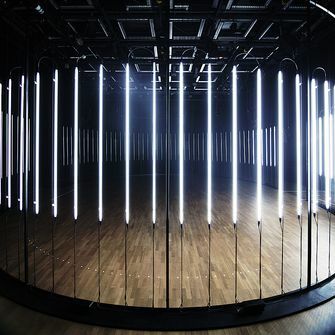 /CZ/ Petr Nikl is a well-known Czech visual artist and performer, winner of the prestigious Jindřich Chalupecký Award who is recognized mainly for his playful interactive projects knowns as Orbis Pictus. David Vrbík works with different audiovisual media and he often presents sound and laser performances. Reflected light is mirrored by a surface submerged in water basins. 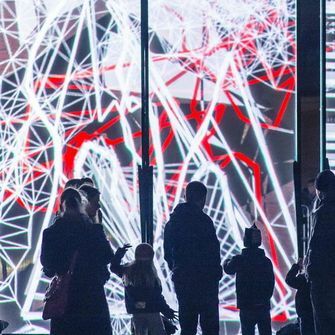 “Our projection combines direct reflection and the reflection distorted by the ever-changing water that we and the visitors manipulate, both mechanically and by means of electro-acoustic sound waves…,” explain the authors about this interactive installation. The result is a site-specific, ambient and evocative atmosphere.